The light coating allows you to see the shrimp through the crust. You can substitute shucked oysters for this recipe. Placed the cleaned and shelled shrimp in a bowl. Add enough buttermilk to just cover the shrimp. Add as much hot sauce as you like. Refrigerate this shrimp for at least four hours. Mix the corn meal, the flour, the sea salt, and the red cayenne pepper in a bowl. Dredge the shrimp in the flour and corn meal mixture. Remove any excess coating by placing the shrimp in a strainer and shaking it. Heat the vegetable oil on medium high heat in a 12-14 inch non-stick skillet for four minutes. Saute the shrimp in the oil for about two minutes on each side or until the shrimp are pink and the crust is golden brown. Drain the shrimp on a sheet pan lined with parchment paper. Spread tartar sauce on both sides of the submarine roll. 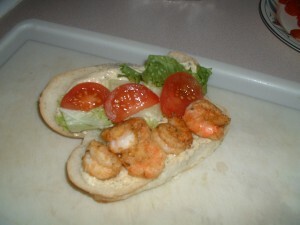 Add the cooked shrimp to the bottom part of the roll. Top the shrimp with tomato slices and lettuce. Close the sandwich and serve. Put all of the ingredients into a food processor. Blend until smooth. Taste and add more sea salt and/or hot sauce, if desired. Sprinkle the cod fillet pieces on both sides with 1/2 teaspoon of sea salt and 1/4 teaspoon of red cayenne pepper. Put the flour on a plate. Add 1/2 teaspoon of sea salt and 1/4 teaspoon of red cayenne pepper. Mix well. Into a shallow bowl, add the beaten egg, the water, 1/4 teaspoon of sea salt, and 1/4 teaspoon of red cayenne pepper. Mix well. Add the remaining 1/2 teaspoon of sea salt and 1/4 teaspoon of red cayenne pepper to the bread crumbs and mix well. Spread the seasoned bread crumbs out evenly on a plate. Dredge a piece of fish in the flour. Shake off the excess flour and place the fish into the egg and water mixture. Make sure that the fish is coated evenly with the egg and water mixture. 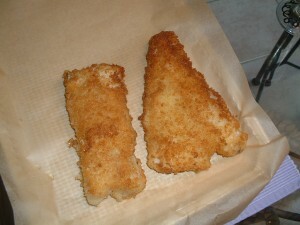 Finally, place the piece of fish into the bread crumbs. Coat the fish uniformly with the seasoned bread crumbs. Repeat the process with the other piece of fish. Into a 12-14 inch non-stick saute pan, add the olive oil. Put the skillet on medium high heat. Heat the olive oil for 4-5 minutes or until it begins to ripple and smoke slightly. Place both pieces of the fish into the pan. Saute for about 3-4 minutes on each side or until the bread crumbs turn golden brown. At this point, remove the fish to a sheet pan lined with parchment paper. Put the fish in a preheated oven set at 250 degrees for 15-20 minutes prior to serving. 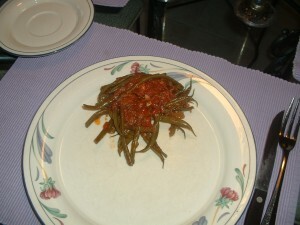 Serve with lemon wedges and tartar sauce (see my recipe for tartar sauce posted to this web site on 3/30/11). This method of cooking this classic dish eliminates any excess chicken fat in the sauce. 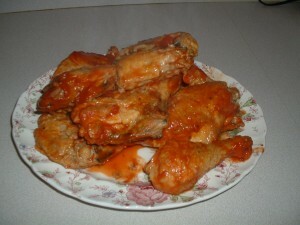 The texture of the sauce is subsequently thicker and richer tasting. Sprinkle the chicken pieces on both sides with a teaspoon of sea salt and the black pepper. Into a Dutch oven, add the olive oil. Put the pot on medium high heat for three minutes. Place the chicken pieces into the pot. Brown the chicken on both sides. Note: Do not crowd the pot as the chicken will not sear properly. 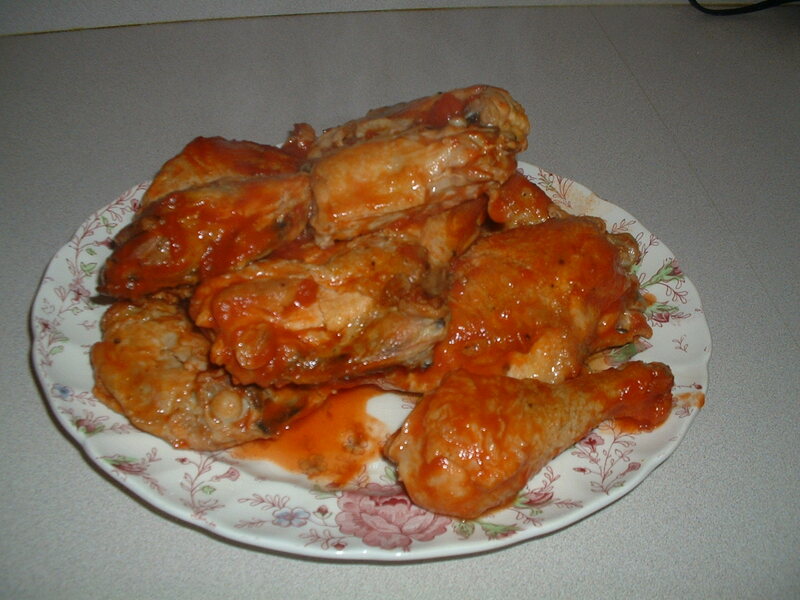 Depending on the size of the chicken pieces, you may need to cook the chicken in two batches. Place the chicken on a sheet pan. Roast the chicken in the preheated oven for one hour. Remove the chicken from the sheet pan and set it aside. Discard the chicken fat that has accumulated in the Dutch oven but retain the brown bits that are on the bottom of the pot. Put the Dutch oven on medium heat. Add the garlic, the onions, the peppers, and two teaspoons of sea salt. Cook while stirring for three minutes. Add the white wine. Scrape the bottom of the pot to release the brown bits that have accumulated. Let the wine cook with the vegetables for four minutes. Add the tomato paste. Stir to incorporate the tomato paste with the wine and the vegetables. Add the tomatoes. Stir again. Taste and add more sea salt, if needed. Add the basil, the parsley, and the oregano to the Dutch oven. Finally, add the chicken back to the pot. Place the Dutch oven uncovered in a preheated oven set at 375 degrees. Bake for one hour. Before serving, remove the parsley and the oregano sprigs. Preheat the oven to 485 degrees. Drain the tomatoes in a colander to remove the can juices (Note: retain the can juices and use at a later date for recipes that call for tomato puree). Place the drained tomatoes in a mixing bowl. Crush the tomatoes with your hands into smaller pieces. Add the garlic, the basil, the marjoram, the sea salt, and the crushed red pepper flakes. Mix well. 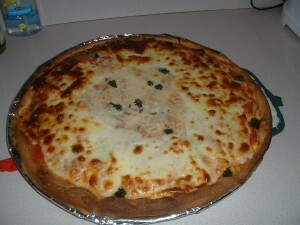 Place the pizza crusts in the pizza pans. Using a pastry brush, apply the olive oil evenly on top of each pizza. Spread the tomatoes out uniformly on top of each pizza. Top the tomatoes with the mozzarella cheese. Bake the pizzas in the oven for 15 minutes until the cheese becomes bubbly and slightly browned. Let the pizzas cool for 15 minutes before cutting. The use of a pizza wheel is recommended. Build this sandwich with leftover pork or turkey roast. This sandwich is great for tailgate parties. Start building this sandwich by spreading as much creole mustard that you want on both sides of the bread. Place the pork or turkey down first. The Canadian bacon is placed down next on top of the pork or turkey. Now add the cucumber slices on top of the Canadian bacon. Finally, add the provolone cheese on top of the cucumber. Close the sandwich and wrap it tightly with aluminum foil. Place the sandwich on a sheet pan. 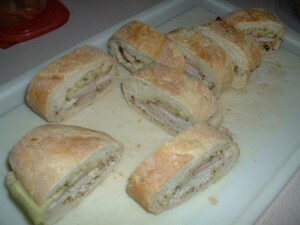 Weigh down the sandwich with a heavy oven proof pot or skillet. Bake in the oven for 35 minutes. Remove the sandwich from the aluminum foil and slice it into smaller sandwiches. 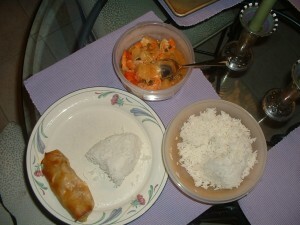 The egg rolls can be made ahead of time and warmed in an oven set at 200 degrees about 20-30 minutes before meal time. The sweet and sour shrimp and the basmati rice can be made in 20 minutes. It would take longer to order and have a Chinese dinner delivered. Dissolve the corn starch into the stock (by adding and stirring). Set the stock aside. Into a 12-14 inch non stick skillet, add the canola oil, the sesame oil, the ginger, the garlic, and the scallions. Cook while stirring frequently on medium high heat for two minutes. Add the onion and the red bell pepper. Cook while stirring frequently for four minutes. Add the shrimp. Cook while stirring frequently for four minutes or until the shrimp turns opaque. Add the orange marmalade, the Sriracha sauce, the soy sauce, the rice vinegar, the honey, and the pineapple chunks. Stir well and cook for two minutes. Add the stock (with the dissolved corn starch). Stir well and let the mixture cook until the sauce thickens. Turn the heat down to low and keep warm until you are ready to serve. Combine all of the ingredients into a saucepan with a cover. Bring to a boil over high heat. Stir well. Reduce the heat to low and simmer covered for 15 minutes. Remove from the heat and let the rice stand for 5 minutes. Fluff with a fork and serve. This dish can be made in the time that it takes to cook the pasta. Cook the pasta in a pot of salted, boiling water according to the package instructions. 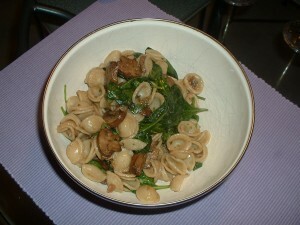 Before draining the orecchiette, reserve 3/4 cup of the pasta water. While the pasta is cooking, add the pancetta and a tablespoon of olive oil to a 12-14 inch wide, 2 inch deep pan. Cook the pancetta on low heat until it is crispy. Remove the pancetta and let it drain on a plate lined with a paper towel. Add the mushrooms to the pan. Cook the mushrooms on medium high heat without touching them for five minutes. Turn the mushrooms over and cook them for an additional two minutes. Add the shallot, the garlic, the thyme, the rosemary, the parsley, the sea salt, and the ground black pepper to the pan. Mix well. Add the balsamic vinegar. Scrape the bottom of the pan to loosen any of the brown bits that have accumulated. Cook for an additional minute. Add the pancetta back to the pan. Turn the heat down to low. Into a large mixing bowl, add the baby spinach and two tablespoons of olive oil. Give the baby spinach leaves a gentle toss to get them coated slightly with the olive oil. Add the cooked pasta and the reserved pasta water to the pan with the mushrooms. Cook on medium heat while stirring for three minutes. Add the orecchiette and the mushrooms to the mixing bowl. Mix well with the baby spinach leaves. The heat of the cooked pasta will wilt the spinach. Serve with grated cheese. Pour the broth into a pot and put it on low heat. Cook’s note: it is important to keep the stock warm during the cooking process. Into a 12-14 inch shallow sauce pan, add the olive oil and the pancetta. Cook the pancetta on low heat until crispy. Add the onion, the garlic, the sea salt, and the ground black pepper. Turn the heat up to medium. Cook the garlic and onion while stirring frequently for two minutes. Add the wine and cook for an additional four minutes. Scrape the bottom of the pan to loosen any of the brown bits that have accumulated. Add the rice. Stir so that all of the grains get coated with the white wine and the other ingredients. Add four ladles of the warm stock and stir the stock and the rice. Cook’s note: continue to stir the rice throughout the cooking process. When the rice absorbs the four ladles of stock and the sauce pan looks dry, add two more ladles of stock. When the rice absorbs the two ladles of stock and the sauce pan looks dry, add two more ladles of stock. Continue this process for 25 minutes. Taste the rice after 25 minutes for doneness. The rice is cooked when it is al dente (tender but still firm to the bite) and the mixture is creamy. If the rice is cooked, turn off the heat. If not, continue addding more stock a ladle at a time while stirring until the rice is al dente and the mixture is creamy. 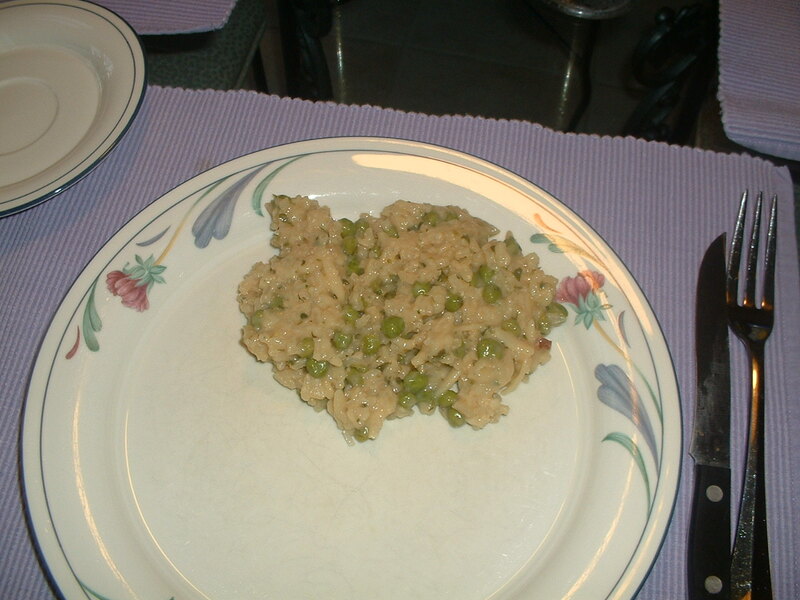 When the risotto is done, add the peas, the parsley, the grated cheese, and the butter. Stir the mixture until the cheese and the butter have melted. Let the risotto sit off the heat for three minutes before serving. Into a Dutch oven, add the olive oil, the onion, the garlic, the lemon zest, the sea salt, and the crushed red pepper flakes. Cook while stirring frequently for two minutes. Add the tomato sauce. Stir well. Add the green beans and the lemon juice. Stir so that the green beans get coated with the tomato sauce and the rest of the ingredients. Cover the pot. Cook in the preheat oven for 90 minutes. Stir in the chopped parsley right before serving.